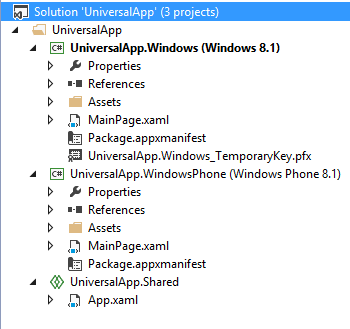 This article will demonstrate usage of Universal app project for Windows 8.1 and Windows Phone 8 and also pointing out what to be put in shared code. In recent Build 2014 event, Windows Universal App was one of the exciting feature that Microsoft rolled out to empower Windows Phone and Windows store apps development in unified way. This code sharing strategies between Windows Phone 8.1 and Windows 8.1 makes it pretty easier to develop for both platform and sharing most of the code and resource. This is pretty much similar to iOS development where you have Universal apps that runs on both iPhone and iPad. It is really “One Windows 8 and rule them all” approach and today we are going to develop our first Windows 8 Universal app! Though this is my first Universal app, there is already first universal app in windows store called Halo: Spartan Assault in windows store as Microsoft has started accepting Universal apps for the store! To get started, please download Visual Studio 2013 Update 2 from the following links based on your version of Visual Studio 2013. 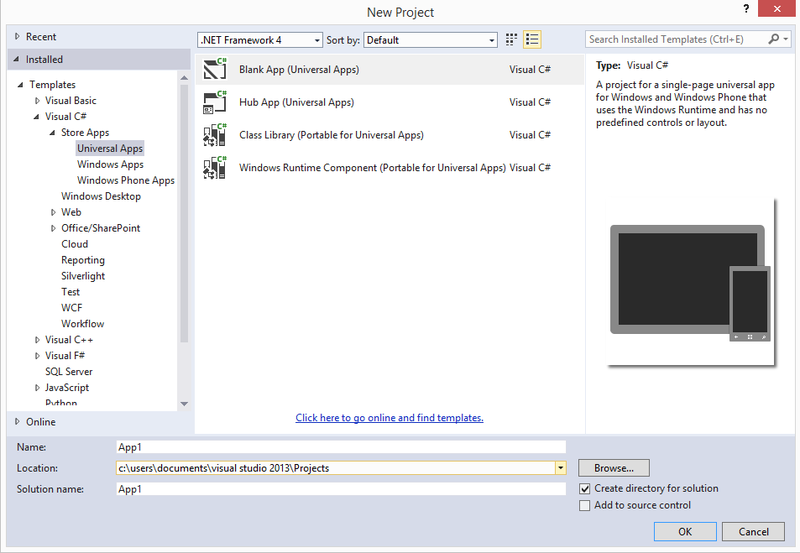 Please keep Visual Studio closed when you install this update and once you are done with install open Visual studio and under C# template, notice Universal Apps project template as shown in Figure 1.0. Let’s create an MVVM Universal app! Go ahead and create project of type Universal app and name it whatever you want. When you see the solution created for you, you will notice three different projects created as per Figure 1.1. One is for Windows 8.1, one for Windows Phone 8 and one as shared project. 1. Write your common code such as ViewModels, Models. 3. Create user control and custom control that can be reused in both the project. 6. Should not put entire xaml page as shared control as space utilization is very limited on Windows phone 8 compared to Windows 8.1 apps that run on device such as Surface. 7. Should not put user control/custom control which uses controls that can’t be available on both platform such as maps. Now put following piece of xaml markup in both the MainPage. Add ViewModel class with following code in Shared project. Note that Listing 1.1 shows very basic view model class where I am implementing INotifyPropertyChanged. As a good practice you would usually have base class implements this interface. Now in both MainPage’s code behind, set DataContext to new instance of this ViewModel class as following. 1. Read my earlier article on the Windows 8.1 Localization here and try to implement common Localized resource file (resw) for both Windows 8.1 and Windows Phone 8 in Universal app project template.